Raw Material And Cosmetics Beauty Product Packaging, Natural Organic Ingredient. 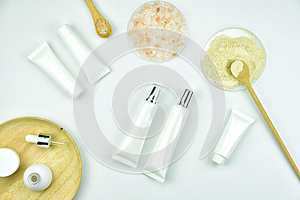 Photo title: Raw material and cosmetics beauty product packaging, Natural organic ingredient. Raw material and cosmetics beauty product packaging, Natural organic ingredient for skin care.